One-hundred high school marching bands will take the field Thursday, Nov. 12 through Saturday, Nov. 14 for the Bands of America (BOA) Grand National Championships at Indianapolis' Lucas Oil Stadium. 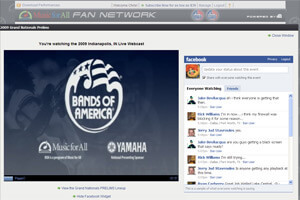 If you're far from Indy and unable to attend, you'll still be able to follow all of the action as it happens thanks to the power of Drum Corps International's online media platform, the Fan Network. The following Grand Nationals events will be Webcast on the Music For All Fan Network, and can be accessed individually by pay-per-view, or with a Fan Network subscription. The best value to catch all of the excitement is the $59 Music For All Fan Network Plus subscription which gives you access to all four Grand Nationals Webcasts in addition to OnDemand replays from select BOA regional events and the Grand National Prelims, among other features.